When choosing storage containers for your home you want to be mindful of a few things: beauty, function, safety, and durability. 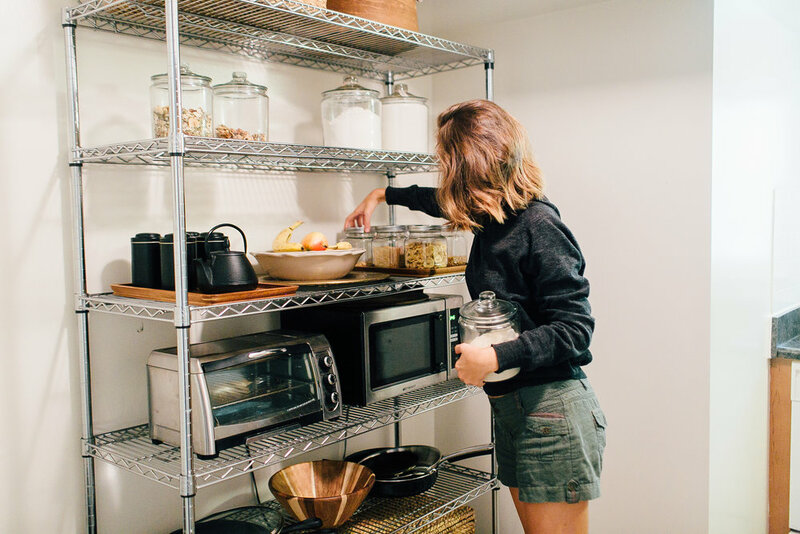 One of my main goals when styling the metal shelf in our kitchen (I refer to it as our "pantry") this past spring was to add a level of warmth and natural elements to it. I did so by incorporating the use of wood, woven baskets, glass, and fresh produce. I wanted it to be clean but stylish; just like every other shelf in our household. Because I spend a significant part of the day in the kitchen cooking, cleaning, and preparing meals I wanted it to be a room that I would enjoy. Along with being beautiful our pantry also had to be functional. The items are arranged in such a way that makes this possible, with the ones that we use most often being front and center while the ones that we use on a less regular basis being on the very top and bottom. We got creative by hiding some of these items such as bread machine and stemware in woven baskets, that keep them hidden and yet still accessible. The glass canisters also make accessing things such as flour, nuts, and granola quick and easy. I am a strong supporter of storing dry goods in glass jars and canisters as they store well, keep items organized, and allow you to see how much you have. The safety aspect of choosing storage solutions for your home comes in the way of choosing natural materials over plastics. Not only are natural storage containers a healthier choice for you and your family, they are also less harmful to the environment. Bonus they are way more stylish and are often more durable! For example, items made out of real wood, especially older wood, are quite strong. Another great feature about natural materials is that they blend in with whatever style your home may be - modern, coastal, traditional, bohemian - they work with them all. The last two photographs are by Zoe Grant.